Enjoy your motorhome break – keep cool with Viesa! and your family while on your motorhome holiday. Campsite owners no longer allow campers to plug in mains powered air conditioning systems by installing low amperage circuit breakers on sites. Your problem is solved with the VIESA holiday unit allowing you to run the system on your auxiliary battery for days with no need for engine running or mains power. Contact us and we will be happy to explain how we can transform your motorhome. Enjoy the Airconditioning experience anywhere. 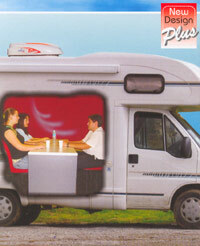 Unlike other systems it allows fresh air into your camper or caravan. Remote control fan speed and on / off controls. Models stocked for vehicles with or without sunroof. Environmently friendly - uses no refrigerant - Not affected by the proposed phase out of R134a. Have the luxury of airconditioning – at an affordable price!